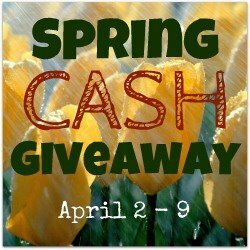 Spring is here and whether you want to spruce up your gardens or need some summer clothes for yourself or your children everyone can use some extra cash... so why not enter the Spring Cash Giveaway it is open to everyone worldwide and you could be the luck winner for $108US. You can't win if you don't enter so why not enter. Will only take a few minutes of your time for a big pay off. This Lil Piglet and Tales of a Ranting Ginger, together with a group of fabulous Canadian bloggers are proud to present the Spring Cash Giveaway April 2nd 12:01 am EST- 9th midnight. Enter to win $108 US cash via PayPal. Anyone with a PayPal account can enter to win this cash prize; open worldwide! WINNER was Entry #3167Shannon S.